Puerto Deseado is a small town in the province of Santa Cruz of 13.200 inhabitants and its main activity is fishing. It is located in the middle of a sheep breeding area and there is also some wool production activity. Puerto Deseado is connected by highways Nº 3 in a north-south direction, Nº281 and by Nº25 towards the west. There is a small airport for domestic flights. It is the center of the local fishing industry and about 60/65 fishing vessels operates annually. 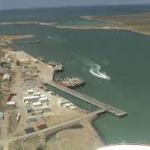 There are 8 fish processing plants in the town and an average of 70/90 foreign going reefer vessels call every year; all fish exports take place alongside using local stevedores, there being no direct transshipment at anchor off the port Also, recently mining operations in th province of Santa Cruz have impacted on foreign trade through this port. (NOTE: due to a circumstantial low profitability of fish catches, the port has decreased its activity in the last two years). 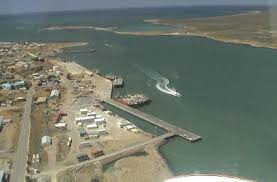 There are three adjoining wharfs at Puerto Deseado, all lying at an angle to each other: Berths 1 to 4 are used by ocean going vessels and berths 5 and 6 by fishing vessels, with fresh water, electric power and fire fighting system; slops only at berth 1&2. Additionally, east of berth 1 a floating landing stage (steel pontoon) is being built in position known as “Sitio 0” (berth Nº 0); 75 meters long, 13 meters wide, for vessels up to LOA 90 m and 1.800 ton, fixed to shore by 2 pivoting steel arms, and one 4 m wide causeway; depth abt. 10,50 m (34 ft) at datum. Gas oil available locally from storage tanks on quay, however fuel oil must be requested via Buenos Aires in plenty of time to be supplied by tank lorries from Bah’a Blanca or Comodoro Rivadavia. Within the port area, a private firm operates a dry-dock for fishing vessels and its effective dimensions are 87,5 x 15 m. There is also an adjacent wharf offering 50 m frontage for fishing vessels repairing, laying by or discharging. Available a 900 HP launch used for pilotage and other services. Entry into port is governed by depth on the bar, which is adjacent to the berths and has a depth of 4,10 m at datum. Vessels berth with 6/7 shackles out on the port anchor, starboard side to the quay without tugs, as soon as the ebb tide starts to make. Unberthing takes place about one hour before high water. There are no official LOA restrictions and vessels of up to 180/190 meters LOA have berthed. However, winds at the time of berthing need to be taken into consideration and agents/pilots should be consulted before committing a vessel over 170 meters LOA. Due to the depth on the bar the maximum permitted draft is 8,20 m ; however, plans are to dredge at the bar to allow drafts of 9,70 m.
SSE of Foca Rock, depth 15-20 m (49-65 ft). Sailing directions recommend the anchorage at lat 47º 47´5 S Long 65º 47´8 W. Vessels can also anchor closer to pilot station at 47º 46´S 65º 49´W. NOTE: Sunken vessels at 47º 45´47´´ S 65º 54´25´´ W (Mar Brillante) and 47º 46´05´´ S 65º 50´07´´ W (Magallanes II). At entrance channel up to 5 or 6 knots; adjacent to berth about 1,5 knots (both cases direction depending on tide). Pilots embark/disembark approximately at 47º 46´4 S -65º50´2 W.
Deseado Prefectura Naval Radio (Coastguard) on 4149/4125/8294 Khz. Callsign L4N. VHF on channels 9, 12, 14, 15 (meteorology) 16 y 77. Emergency and security calls 2182 Khz and channel 16. Available at Municipal Hospital and also at private clinic. Two good hotels with others of lesser category. Bus services to Caleta Olivia and Comodoro Rivadavia with connections to Buenos Aires/Río Gallegos and other intermediate cities. available at Comodoro Rivadavia and Río Gallegos. Compulsory for all vessels of over 2000 ton GRT. Seasonal winter zone (16th Apr ¥15th Oct) See ILLC. At COSERENA dry dock and slip¥way, for fishing vessels/small craft. Naval, electrical, electronic repairs can be carried out but spares are not available locally. Mobile cranes: 1×50 ton, 1×45 ton, 1×41 ton. Private contractors working in the port also operate mobile cranes and forklift trucks. Available in the city. Due to limited local stocks any orders should be placed in good time. The Prefectura Naval (Coastguard) has a cutter stationed at Puerto Deseado, and the pilot launch is also available. Vessels berth/unberth without the aid of tugs. However, with larger vessels and in certain conditions the pilot launch assists as required. About 10.000 sqm on quay and adjacent spaces and a truck area of 8000 sqm. Bonded warehouse of 650 sqm covered area. Not available in port. Available in private container yard. 380 V available at quays. Available on request, by private companies.